Lest anything think otherwise, I have placed a sign in my garden so that everyone will know that it is my garden. This is my garden. I am responsible for the weeds, the bare spots, and the unraked leaves. This is my garden. I am also taking credit for each and every bloom, each and every surprise, whether good or bad. Garden fairies here! We are garden fairies and we cannot let this drivel continue, this grandstanding, self-righteous bunch of.. well, stuff. Carol is not quite the owner of this garden as she thinks she is, in spite of her claims and signs and possessiveness of it. We are garden fairies. We are out here day in and day out, night in and night out and this is our garden. We are responsible for it and take great pride in it. We are the ones who have to correct Carol's mistakes. We are the ones who have to endure some of the crazy stuff she tries in this garden. We only stay in this garden because there is great potential here and it is kind of fun to see what Carol does out here, stuff like planting 1,100 crocus corms in the lawn. We were as excited as pillywiggins to watch that. Wait, some of us are pillywiggins. Anyway, that was exciting. We are also excited because Carol bought just a few more bulbs the other day. Once she plants those, she'll go around saying that she planted more than 1,500 bulbs this fall. Well, numbers don't mean diddly to us garden fairies, we are more excited by the all the blooms that will be here this spring. Carol's garden, indeed. We'll let her think that this is her garden so she'll keep buying plants and flowers. We'll lead her on so she'll pull weeds and add mulch. We'll let her put up her little sign in the vegetable garden. We'll do all that because, say it together with us, we are garden fairies. Violet Greenpea Maydreams, formerly known as Thorn Goblinfly, chief scribe for all the garden fairies and those of that ilk here at May Dreams Gardens. Thank you for the well needed laugh and smile. 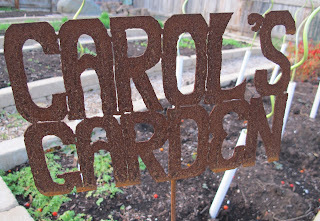 Love the sign Carol and to the garden fairies...keep up the good work in helping with the garden. Carol did buy the bulbs though so she does get some of the credit! Love the sign,Carol. My son made me a Mary's Garden sign several years ago made entirely of plumbing fittings. Fairies have ignored it completely, but the gnomes have shown some interest as I find it knocked askew occassionally.